The New Majority Rules: Top 5 @ 5! Choose the soundtrack for your ride home with the Majority Rules "Top Five At Five!" We'll feature a different year or theme every weekday plus, each day when you vote you're registered to win your choice of tickets to an upcoming Promowest Productions concert! 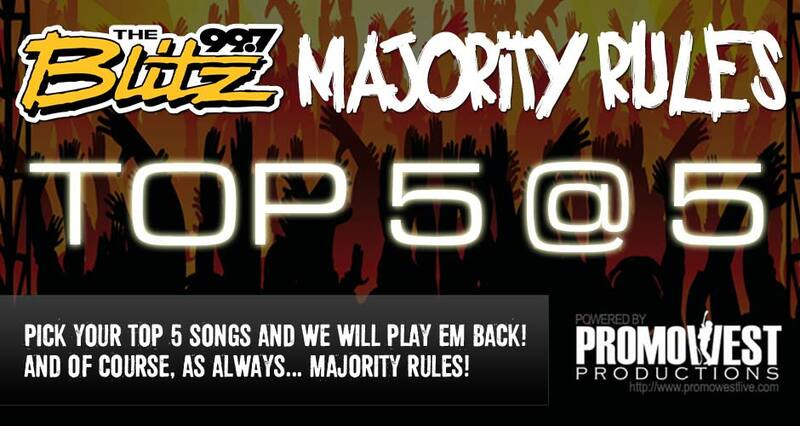 The majority rules "Top Five At Five" is powered by Promowest Productions! Weekdays at 5pm on Columbus' Rock Station, 99.7 The Blitz! Text TOP to 99700 to VOTE NOW!